This story of the risen Lord appearing to two despondent disciples later on the day of His resurrection tends to get overlooked in the excitement of the rolled back stone, the empty tomb with grave clothes left behind, and the angels announcing “He is not here, He is risen!”. Yet at the end of a blessed and full Easter day today, and after 6 weeks of daily meditations in preparation for this day, it is the Road to Emmaus that I keep coming back to. It reaches me because it makes my heart burn, not in a “too much acid” way, but in a “wishing I could more fully understand God’s plan for us” way. It helps open my eyes and see a living Jesus in the people around me. Like so many, I tend to walk through life blinded to what is really important, essential and necessary. I can be self-absorbed, immersed in my own troubles and concerns, staring at my own feet as I walk each step, rather than looking at the road ahead and taking joy in the journey. He is the bread of life so I am fed. He is the living water so I no longer thirst. He is the light so I am never left in darkness. He shares my yoke so my burden is easier. He clothes me with righteousness so I am never naked. He cleanses me when I am at my most soiled and repugnant. He is the open door–always welcoming, with a room prepared for me. So when I encounter Him along the road of my life, I need to be ready to listen, ready to invite Him in to stay, ready to share whatever I have with Him. When He breaks bread and hands me my piece, I want to accept it with open eyes of gratitude, knowing the gift He hands me is nothing less than Himself. Do not pass Holy Saturday without a second thought. There was recently another student suicide in our community on the Lakota reservation. While I did not have the student in one of my classes, I had many of her friends as students. As I saw their despair, confusion, and grief I felt a deep and real frustration with God. How could someone, with only 16 years of living, make the determination that they no longer deserved to live, or could not tolerate living any longer. What kind of world is it in which God has us live? Instead there was a deep and real despair, along with a re-entering into the daily routine. Joseph knew the Sabbath was about to start and he had to get Jesus down and placed in the tomb before it did or else he would be ceremonially unclean. Had he or the disciples known what was going to happen, the Resurrection on the third day would not have been nearly as glorious. natural response. To simply say it will all get better is to ignore the reality of sin and pain that we know from experience are the realities we face on a daily basis. Take time to mourn. Take time to lament. Give yourself the time and space to sit in discomfort. The disciples took time to be in that space. Christ himself took time to dwell in that space. The pain and sin we face are real. Take time to let that sink in before the coming morn establishes a new reality. To worthless things and forfeit life. He is a source of peace—and strife. That men have thought they could conceal. Will see what wicked men can do. the hem of his mother’s robe. This was the day she had been told would come yet she could not have anticipated how horrific would be His suffering, how hideous His wounds, how extensively His blood covered those around Him. She could not have imagined the helplessness she felt in being unable to comfort Him, ease His pain, or smooth His torn brow. She could not have known she would feel His hurt so deeply; it was as if she too had been lacerated and drained of life herself. Yet looking down at her from the cross, despite His own distress, He compassionately provides for her future care and protection. He continues loving her even when He is beyond her reach. He doesn’t abandon her even as He endures the unendurable–separation from His Father and betrayal by His people. She shed her blood bearing Him, birthing Him to breathe and walk and live fully on this earth; now her heart breaking, she watches Him surrender and take His last breath. He sheds His cleansing blood in parting, once and for all mending all that is pierced and broken in us, yet rending forever that which separates us from God. Then he returned to his disciples and found them sleeping. “Could you men not keep watch with me for one hour?” he asked Peter. “Gethsemane” means “oil press” –a place of olive trees treasured for the fine oil delivered from their fruit. On this Thursday night the pressure is turned up high on the disciples, not just on Jesus. The disciples are expected, indeed commanded, to keep watch alongside the Master, to be filled with prayer, to avoid the temptation thrown at them at every turn. But they fail pressure testing and fall apart. Like them, we are easily lulled by complacency, by our over-indulged satiety for material comforts that do not truly fill hunger or quench thirst, by our expectation that being called a disciple of Jesus is enough. It is not enough. We fail the pressure test as well. We sleep through His anguish. We dream, oblivious, while He sweats blood. We deny we know Him when pressed. Incredibly -He loves us anyway. Having grown up in the Episcopalian tradition, I’ve always associated the season of Lent with fasting. And I’m not very good at fasting in general. Which means I’m really bad at Lent. When I say bad, I mean really, really bad. One year in college I tried to give up chocolate and found myself buying Coco Puffs at the grocery store because breakfast food can’t be considered chocolate, right? That was before I made a complete face plant into a chocolate fondue fountain at a social event. Last year I tried to give up television and I didn’t even realize that I was watching television until I was into the second dvd of the Lord of the Rings trilogy at a movie marathon event. This year I pretended that I didn’t even give anything up because I failed so quickly I didn’t even want to admit I’d tried. Confronted by my own abysmal failure, I’ve spent some time pondering the purposes of Lent. I’ve always assumed that the fasting was intended to make us holier–that fasting during Lent eliminates something from our lives that is distracting us from God and in giving that one distraction up, we make ourselves into a worthier sacrifice. But I realized that there’s a flaw in my thinking. I, of my own volition, cannot make myself a worthier sacrifice. I am incapable of saving myself, reforming myself, purifying myself. Paul says in his letter to the Galatians, “So I say, walk by the Spirit, and you will not gratify the desires of the flesh. For the flesh desires what is contrary to the Spirit, and the Spirit what is contrary to the flesh. They are in conflict with each other, so that you are not to do what you want. But if you are led by the Spirit, you are not under the law” (5:16-18). He doesn’t say, “If you summon up enough will power, you will be able to resist your flesh.” No, he says that we master the desire of our flesh when we are led by the Spirit. And in order to be led, we need to submit, lay down our notions of spiritual grandeur, and follow. While I know that I’ve failed at fasting, I don’t think this season has been wasted space because in my failure I’ve managed to acknowledge my own inability to fix myself and my desperate need for a Savior. And perhaps that’s the purpose of Lent–to see our abyss of sin, to become aware of how futile our attempts at holiness really are, and to be humbled at our own inability to master ourselves. And this is grace–that in our sinful weakness, Jesus would die for us. Christ’s sacrifice on the cross stands in starker contrast when you know he died for us as sinners, than if he had died for us, the self-reformed and perfectly-disciplined fasting-machines. 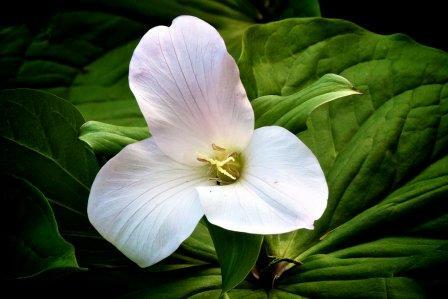 The trillium only thrives where death has been. The mulch of hundreds of autumns fluffs the bed where trillium bulbs sleep, content through most of the year. When the frost is giving way to dew, the trillium leaves peek out, curious, testing the air. A few stray rays of sun filtering through the overgrowth and canopy encourage the shoots to rise, spread and unfurl. In the middle, a white bud appears in humility, almost embarrassed to be seen at all. There is pure declaration of triune perfection. In a matter of days, the petals spread wide and bold so briefly, curl purplish. Wilt and return aground. Leaves wither and fall unnoticed, becoming dust once again. Death gives way to pure perfection. This is a week of letting go while holding on. I grasp and carry the load, my load, alongside Him. My turn to hold on and not let go, as if life depends on it.